VA Form 2130 is a United States Department of Veterans Affairs form also known as the "Inspection Sheet - Prosthetic Dealer". 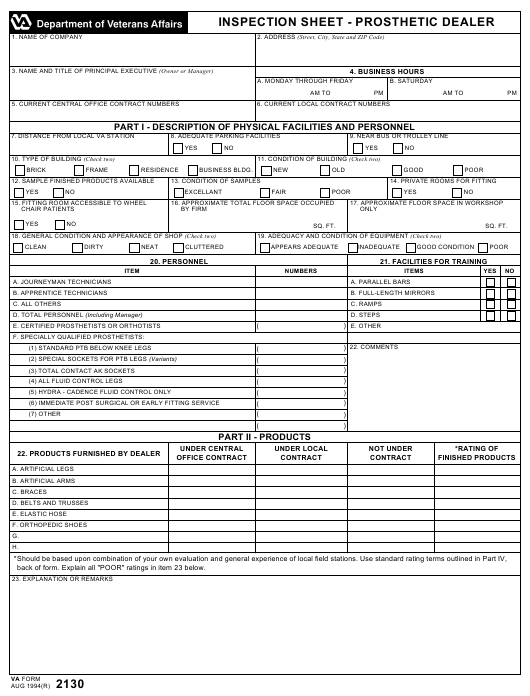 The latest fillable PDF version of the VA 2130 was issued on August 1, 1994 and can be downloaded down below or found on the Veterans Affairs Forms website. back of form. Explain all "POOR" ratings in item 23 below. 25. IF ITEM 24 IS "YES," THEN DOES DEALER PARTICIPATE IN CLINIC SESSIONS? 26. IF DEALER PARTICIPATES IN CLINIC SESSIONS, WHAT IS THEIR HONEST OPINION OF THE CLINIC TEAM? 27. IF DEALER DOES NOT PARTICIPATE IN CLINIC SESSIONS, WHAT REASONS DO THEY GIVE? 28. IS THERE EVIDENCE OF FRICTION BETWEEN THIS DEALER AND PERSONNEL IN LOCAL VA STATIONS? 29. IS THERE EVIDENCE OF EXCESSIVE COMPLAINTS FROM VETERANS AGAINST THIS DEALER? STATIONS IN EMERGENT OR DIFFICULT CASES? 34. IS DEALER CONDUCTING SPECIFIC RESEARCH OR DEVELOPMENT ON PROSTHETIC DEVICES? 35. DOES DEALER PRODUCE DEVICES OF THEIR OWN DESIGN NOT AVAILABLE ELSEWHERE? 39. DOES COMPANY CLAIM CERTIFICATION BY AMERICAN BOARD? any other knowledge you may have concerning the company or its services, check your overall rating for each of the elements below. *FOR CENTRAL OFFICE USE ONLY.